Dennis Collins was born in Wylie, Texas, USA. He is an entrepreneur best known for being part of the reality television series “Fast N’ Loud” where he appears with his friend and fellow car enthusiast Richard Rawlings. He is the owner of the company Collins Brothers Jeep who specialize in restoration and conversion projects for Jeep vehicles. His efforts have helped raise his net worth to where it is now. How rich is Dennis Collins? As of early-2016, sources inform us of a net worth that is at $20 million, mostly earned through success with his business ventures. Being a car enthusiast, it is known that Dennis owns several cars, including the very first Nash-Healey which was produced during the 1950s. His passion for cars would become the reason for his rise in wealth. 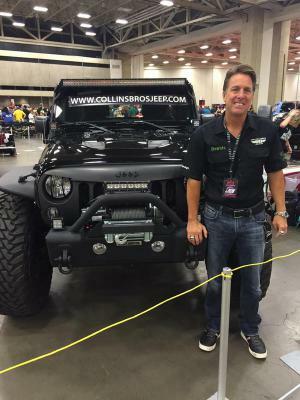 Collins started his rise in net worth after he established Collins Brothers Jeep in Wylie, Texas. They mostly work on CJ and Wrangler Jeeps but eventually earned enough recognition to continue improving the business. He met Richard Rawlings during a 1996 Harley Davidson invitational to car dealers, when they rode from Dallas to Daytona. They became good friends and also became Cannonball road trip record holders. Both of them still do the occasional road runs and Dennis considers some of them to be the craziest things they have ever done in their life. Other than his work with Jeeps, Dennis has also worked with other cars mostly with Healeys, including the 100-6 show car Goldie. Eventually, with the success of Rawlings show “Fast N’ Loud”, Dennis got the opportunity to appear and become a recurring face on the television show. He’s worked in Collins Brothers Jeep for 29 years now, and they have had various celebrities as their customers. “Fast N’ Loud” is a television show from the Discovery Channel which features Gas Monkey Garage and their search for run-down cars. The crew then works on these cars and restores them, incorporating a skit for each episode, and then sell these restorations to others for a profit. The series became successful and is now at its seventh season, with a spin-off show “Misfit Garage”. While Rawlings and Aaron Kaufman are the main stars of the show, they often collaborate with Collins Brothers Jeep and Dennis is considered a member of Gas Monkey. For his personal life, it is known that Collins has been married for 21 years, but otherwise that side of his life private. He also continues to reside in Texas, working on his business and cars. According to him the biggest regret he has was selling the Lawman Mustang for over $100,000 only to later find out that it was subsequently sold for over $2 million. Dennis has five favorite cars, including the 1958 Goldie, the limited edition 71’ Dodge Challenger, a car that he searched for, for 15 years. Other than that, he also favors the Nash Healey sports car, the Ferrari F40 and the Ferrari 550 Maranello. Interestingly, the F40 he owns was also built by Gas Monkey and was featured on the show.